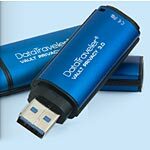 Kingston’s DataTraveler USB Flash drive is the latest in portable storage from the greatest name in memory. Reliable and easy to use, it’s the choice of corporations and consumers for securely storing, carrying and transferring important digital files. Business-Grade Security — 100-percent of stored data is protected by hardware-based, 256-bit Advanced Encryption Standard (AES) in XTS mode. USB 3.0 — latest USB standard guarantees backwards compatibility with USB 2.0. Read-Only Access Mode — when selected, access files in. Read-only Mode to avoid potential Malware risks. Enforced password protection — complex password is user set with minimum characteristics to prevent unauthorized access. Easy to use — no admin rights or application installation required. Customizable — preload content, password length, maximum number of password attempts and internal/external serialization numbering. Durable — resilient protection for data in a waterproof aluminum casing. DTVP 3.0 Anti-Virus features easy-to-deploy anti-virus protection from ESET that protects the drive’s content from viruses, spyware, Trojans, worms, rootkits, adware and other Internet-borne threats. The ESET NOD32 anti-virus engine provides instant alerts. This anti-virus protection requires no installation and comes with a five-year pre-activated license.